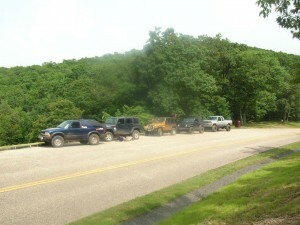 Stoney Run Trail Ride | Capital Off Road Enthusiasts, Inc.
For the long 4th of July weekend, CORE and a guest from the JK list elected to partake in the family and friends celebrations of picnics and fireworks on Friday the 4th and then take the next day to celebrate our own independence by taking our 4 wheel drive vehicles out into the George Washington National Forest for some fresh air, great scenery and a little time away from the hustle of the Beltway and the crowds on the National Mall and at the various shopping malls. 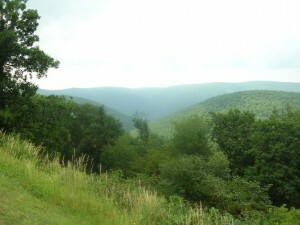 Our destination this day was the Stoney Run trail near Stuarts Draft VA. 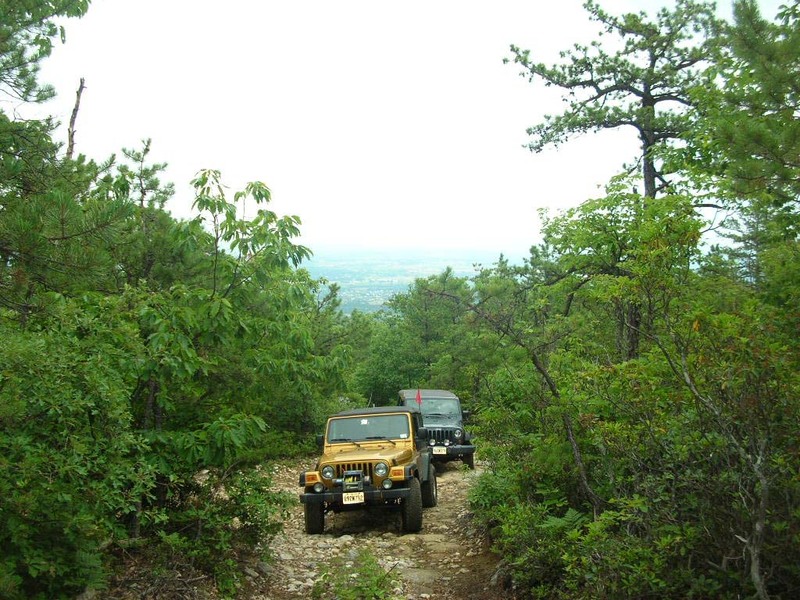 Since our last trip there in 2006, the GWNF has issued their Motor Vehicle Usage Map (MVUM), so our first step in the planning was to make sure that this trail was still listed as a legally open trail, which it is thankfully. Of course, as anyone who has attempted to use the MVUM to determine status of a trail, the lack of detail and resolution makes it something less than a user-friendly document. The status of Stoney Run is that it continues to be a seasonally open trail with the closure during the winter months. The lack of detail on the maps in the MVUM figures in later in the day when more that one wrong turn gets taken. Most of us met at the Sheetz station in Haymarket VA. While a few miles off the most direct route, it does provide a convenient location with room for us to assemble while avoiding the traffic congestion of the shopping and traffic lights in the new construction along US 29 in Gainesville. We had arranged to meet up with Josh in Charlottesville at the Best Buy parking lot. We arrived a bit late there due to the traffic but were soon back on our way. We made a final stop in Stuarts Draft for fuel and then were off. If one were to assign a rating to Stoney Run, it would fall into the blue or green range (few trails in the National Forests are more difficult). It has some challenging spots to be sure but there are generally ways to completely avoid them or to pick an easy line through. The trail essentially goes straight (more or less) up the side of the mountain but there is another path that zig-zags up as well. 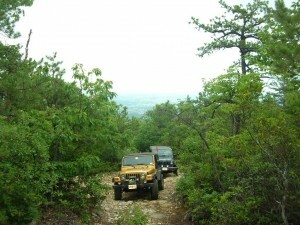 The zig-zap path is graveled and crosses the 4×4 trail several times on its way to the top. 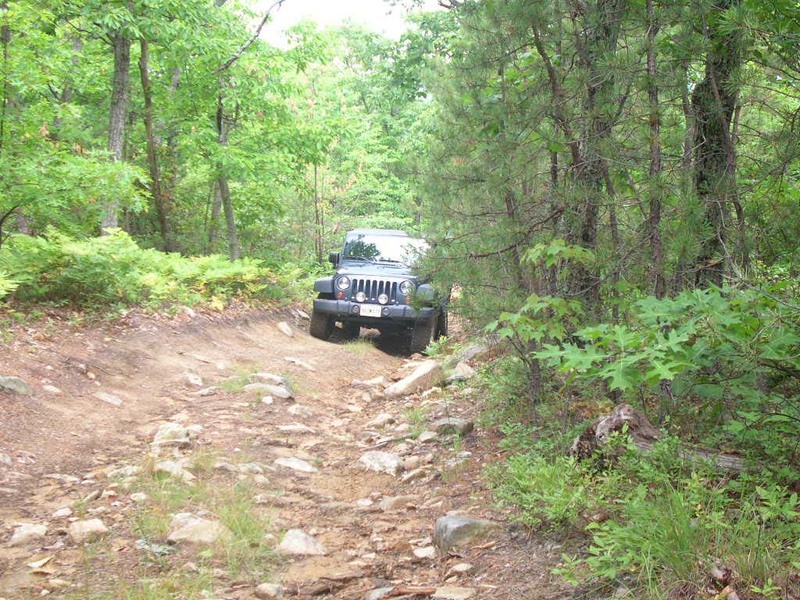 Should one choose to, one could probably take the graveled path to the top in your average passenger car. This zig-zag does allow any part of the trail to be bypassed. The first part of the trail calls for some suspension cycling with loose dirt over a series of unevenly spaced humps which do not go clear across the trail. Ease of passage here is largely a matter of wheelbase and wheel spacing. When I had first run this trail, this particular spot was a challenge due to some exposed rocks. We traveled up the trail with minimal difficulty. The view to see was the one in your rearview mirror as you looked across the valley below. We skipped the last two segments of trail up the side of the mountain. The first one that we skipped was a rather short stretch, probably not more than 100 yards or so. When we last went that way, this stretch had been barricaded at both ends by branches piled into the trail. This time the barricade was gone so we proceeded through. Or perhaps I should say that I proceeded through. About 50 yards in, I came upon another set of branch and undergrowth piled into the trail, apparently with the intent of closing the trail? At any rate, I turned around and came back before any of the rest of our group was committed to this leg. As we got onto the gravel path and drove around, we could see the other end of that segment was still barricaded. Most curious would be a fair assessment. The closure is inconsistent with the MVUM and the materials used are inconsistent with materials and methods used by the Forest Service to signify closure, even when their policy was the much clearer and more user friendly “open unless posted closed”. We continued on over the peak of the mountain and started down what appeared to be a branch trail but before we got very far, Alex called out that his GPS maps didn’t show this trail so we turned back to the main trail and stopped for lunch. 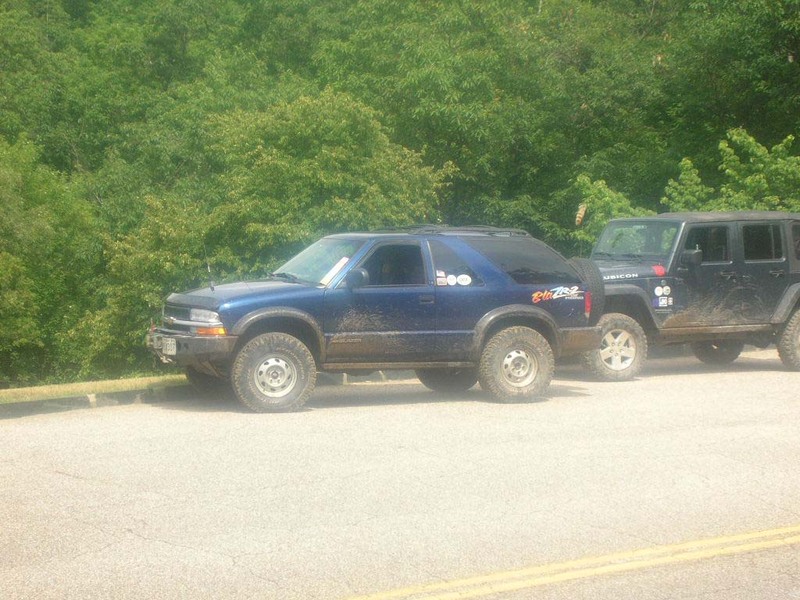 While stopped, we encountered our first other vehicle on the trail that day, a TJ traveling alone coming in the opposite direction. He advised us that there were some deep puddles ahead and continued on his way. He was correct about the presence of the puddles but the depth was of little concern if one drove at a reasonable speed. We actually made most of the rest of the trail meeting or seeing a few other vehicles that had come in from the opposite direction, including a car as we neared the parkway. 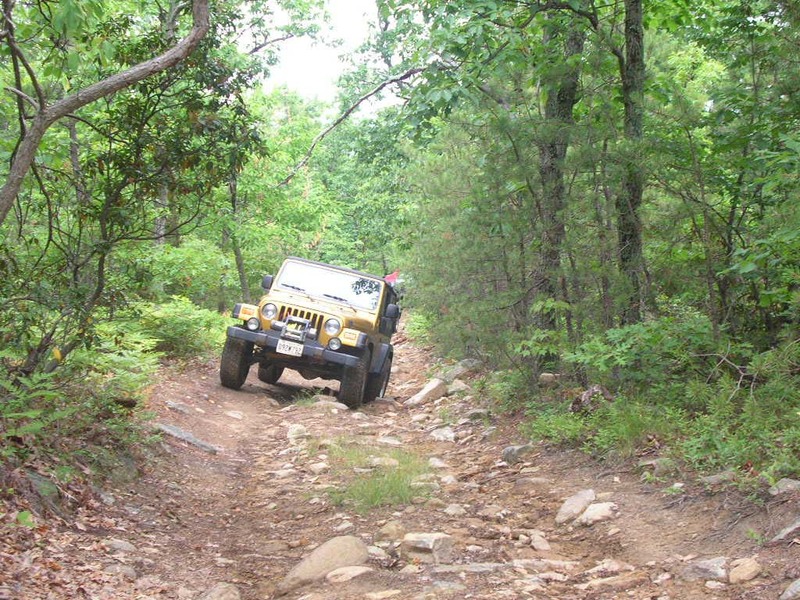 We did stop along the final portion of the trail a couple of times to identify a noise that Alex was hearing from under his Jeep. He eventually narrowed it down to the expansion boot on his front driveshaft. According to him, this bellows type covering is over the extendable part of the driveshaft and apparently had gotten nicked, leaving a flap which caused the noise, due to interference with a skidplate. Once safely identified, Alex removed the flap drove on. We came out on the parkway with some discussion of whether or not to try to run the Shoecreek trail but decided we needed to head for gas first. Once again, Alex called out that the turn we had just passed led to a gas station according to his GPS. This led down a winding road alongside the mountain. At the foot of the mountain, we pulled up as I was now hearing unusual noises of my own. We determined that the noises were coming from the front end and that the front wheels were at odd vertical angles. We proceeded slowly to the GPS indicated gas station. Along the way, we managed to go past another turn but were alerted to that by Alex announcing over the radio just after we passed by. We eventually got to the gas station where my problem was identified as a failed unit bearing on the front axle. Late on Saturday evening, there were no likely sources of the part so we parted ways there with Alex giving me a ride home. 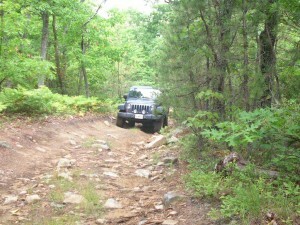 Another good day on the trails, despite some annoyances and repairs to be made. As a footnote to the story, I bought a replacement bearing when the parts stores opened on Sunday morning. I also bought the right size socket and an impact wrench to go with the CO2 tank I had recently added to the back of the Blazer. The change out took a little under three hours (with Betty holding an umbrella over for parts of it) and would have taken much longer without the impact wrench, if I had been able to complete it at all. I consider it a very worthwhile investment. The sealed bearing had been replaced just a short time previous. Conversations with the supplier yielded his agreement that it had probably been a defective part to begin with and a full refund was forthcoming. Trip Report George Washington National Forest, Stoney Run. permalink.